BEIJING, China -- Chinese Vice President Xi Jinping pledged on Wednesday to cement a strategic partnership with Ukraine and boost bilateral security cooperation between the two countries. 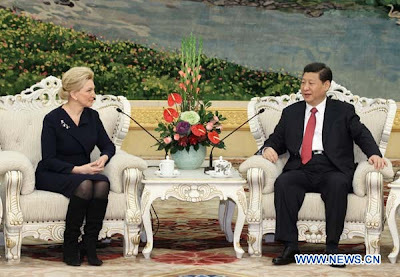 Chinese Vice President Xi Jinping (R) meets with Raisa Bogatyryova, secretary of Ukraine's National Security and Defence Council, in Beijing, capital of China, Dec. 7, 2011. Xi made the remarks while meeting with Raisa Bogatyryova, secretary of Ukraine's National Security and Defence Council, who is visiting China as a guest of Chinese State Councilor Meng Jianzhu. Xi hailed the progress of China-Ukraine relations since the forging of diplomatic ties 20 years ago, adding the establishment of a bilateral strategic partnership this year was an important decision made by the two state leaders in accordance with changes in the global and regional situation. He urged both countries to treat each other as important partners, firmly support one another on issues, cement coordination in global affairs and enrich the bilateral strategic partnership. Xi praised the sound growth of bilateral cooperation in various areas including politics, trade, technology, culture, aviation, agriculture, education and public health. Currently, the world is undergoing major transformation and adjustment, said the Chinese Vice President, urging both countries to face up to the important tasks of developing the economy and improving people's livelihoods. He called on both sides to beef up security cooperation, create a more favorable environment for their development and contribute to regional and world peace, stability and prosperity. In response, Bogatyryova expressed appreciation for China's support for her country, adding the Ukrainian government regards relations with China as a priority in its foreign policy. She said Ukraine is glad to see China's rapid development and its increasingly important role in global and regional affairs. Ukraine hopes to learn from China's development experience and cement cooperation with China in security and other fields, she added. Chinese President Hu Jintao and his Ukrainian counterpart Viktor Yanukovych launched the China-Ukraine strategic partnership during Hu's state visit to Ukraine in June this year.